Know of a open parking lot where a roving nomadic group of foodies could park a trailer and enlighten your lunchtime options? Once I was walking down Denny on my way into downtown and happened upon the Skillet mobile. However, I was freaked out and ran… ran far away. I had no idea what was happening and why literally a hundred people were crushing their way towards an airstream trailer wafting smoke. Now I know my misfortune. Skillet provides a surprise delicious lunchtime option. That is, if you’re lucky enough to have them park their foodie place of worship anywhere close by. So, know of anywhere these guys can setup shop this friday? Email eat@skilletstreetfood.com and let them/me know! 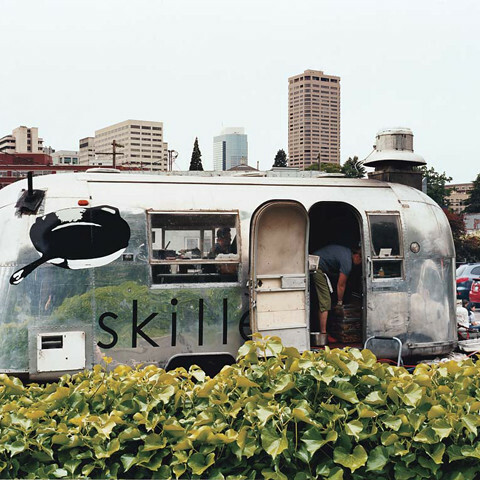 1 Comment on "Give Skillet a Belltown Home"
While you’re at it, could you find a parking spot for a 10′ travel trailer next to them for us? We’ll be there around June. That is completely awesome.